Meet a (Returning) WEXer: Four of Our Favorite Interns Are Back! | WEX Inc.
Four of our superstar interns this summer also participated in our inaugural intern program last year. What brought Adrian, Brent, John and Simone to WEX again? And now that we’re halfway through summer, how do they feel about the decision to boomerang back? We’ll let them tell you for themselves. What brought you back to WEX? JOHN: No other company or internship provides better housing, transportation and competitive pay. It was an easy decision, and I honestly felt wanted here. I knew this summer would be a great time to build on my work last year and a great opportunity to spend another summer in Maine—Texas can get a little too hot sometimes. ADRIAN: I really enjoyed the work that I did last year and learned a lot from the people I worked with. I took a few analytics courses while abroad last fall that solidified my interest in the field, making returning to my marketing analytics role at WEX an easy choice. There’s also nothing better than a summer in Maine. BRENT: My internship last summer was a great experience, but the position didn’t perfectly align with where I saw myself in the future. Last fall, I spoke with Rodrigo Meirelles (WEX’s vice president of new business ventures) at an innovation event WEX held at UMaine. At the beginning of my final semester of college, he offered me a position I was excited about and that aligned well with my goals. 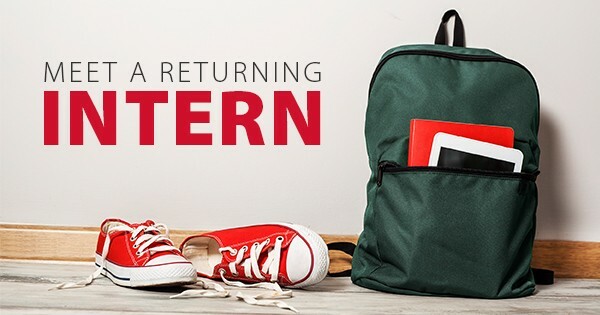 How has this year’s internship experience been different from last year’s experience? SIMONE: Last summer, I spent many weeks learning about our business models, partners and competitors before starting on projects. This summer, I got to begin projects as soon as I arrived. ADRIAN: I was able to start working on projects during week one and have gone more in-depth with my analyses. The faster pace of this year has kept the internship experience fun and exciting. BRENT: There’s more opportunity for professional growth. With more Lunch and Learn events—presented by various members of WEX leadership—I’ve been able to reflect on my approach to achieving more as a young professional. What has been your most valuable experience at WEX? SIMONE: Last week I had the opportunity to go on a business trip to Ogden where I got to meet with a new client, visit our site and meet some WEXers based in Utah. It was great to travel and see a new part of WEX, and to have the opportunity to do so as an intern. JOHN: At one of last year’s Lunch and Learns, Jay Dearborn gave a presentation about WEX’s future growth. He mentioned a five-year stock price target that I thought was a tad ambitious, so I asked him to explain how he got the price that he did. The next 10 minutes were the longest in my professional career. I was in a room full of interns and in the hot seat for questioning someone with years of experience. No other intern asked Jay a question after his response. I walked away with two lessons that day: Be prepared for an elaborate and detailed answer when you challenge someone about their work and don’t be afraid to ask questions in a room full of intelligent individuals. What advice would you give to future WEX interns? JOHN: Be aggressive and attack every opportunity that comes your way. Meet with as many people as you can, learn their story and tell them yours. Also, the best way to contribute to a team is not by asking for work, but rather by having a discussion at the start of the internship and figuring out how you can use your skillset to add value and solve problems. ADRIAN: Don’t be afraid to ask questions—and not just the ones about defining the many acronyms that WEX uses! Everyone I’ve met at WEX has been willing and eager to teach. If you’re interested in what someone is working on, set up a meeting with them to discuss it. The most valuable discussions I’ve had have been the result of one-on-one meetings. If you want to see more of what our interns are doing this summer, check out this video of their adventures on Cow Island. Interested in joining our team? Take a look at our careers page.